184 pages | 19 Color Illus. | 33 B/W Illus. 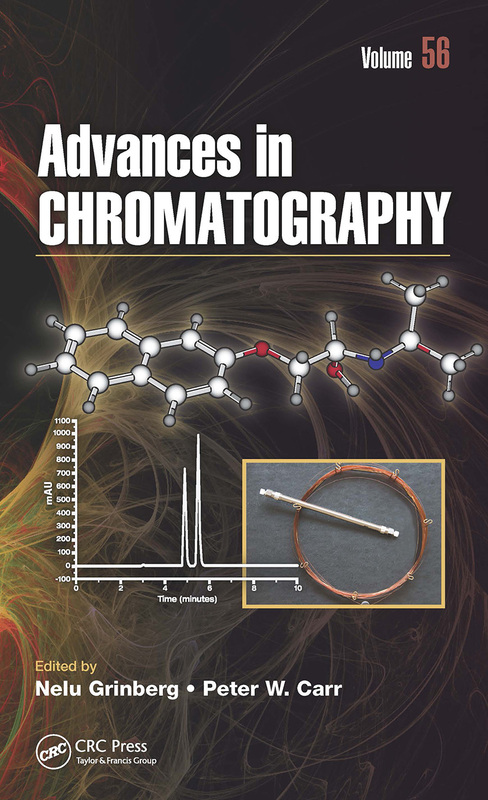 For more than five decades, scientists and researchers have relied on the Advances in Chromatography series for the most up-todate information on a wide range of developments in chromatographic methods and applications. The clear presentation of topics and vivid illustrations for which this series has become known makes the material accessible and engaging to analytical, biochemical, organic, polymer, and pharmaceutical chemists at all levels of technical skill. Includes a chapter dedicated to Izaak Maurits Kolthoff, offering a unique look at his non-professional life as well as his impact and legacy in Analytical Chemistry. Discusses recent advances in two-dimensional liquid chromatography for the characterization of monoclonal antibodies and other therapeutic proteins. Explores recent advances in TLC analysis of natural colorings, determination of synthetic dyes, and determination of EU-permitted natural colors, in foods. Recent Advances in Two-Dimensional Liquid Chromatography for the Characterization of Monoclonal Antibodies and Other Therapeutic Proteins. Solvation processes on reversed phase stationary phases. Thin Layer Chromatography in the Determination of Synthetic and Natural Food Colorants in Foods. Conformers and Oligomers of Intact Proteins. Dr. Nelu Grinberg retired in 2016 as a Distinguished Research Fellow in the Chemical Development Department at Boehringer Ingelheim Pharmaceuticals in Ridgefield, CT. Prior to this, he worked for sixteen years in the Analytical Department at Merck Research Laboratories in Rahway, NJ, where he was a Senior Research Fellow. He has authored and coauthored over 118 publications, including articles and book chapters. He is currently Editor and Chief of the Journal of Liquid Chromatography and Related Techniques, Editor of the book series Chromatographic Science Series, and Co-editor of the Advances in Chromatography series. He is also the President of the Connecticut Separation Science Council and a Koltoff fellow of the Hebrew University of Jerusalem. Dr. Grinberg obtained his Ph.D. in Chemistry from the Technical University of lasi in Romania. He conducted postdoctoral research with Professor Barry Karger at Northeastern University in Boston, Massachusetts, and with Professor Emanuel Gil-Av at The Weizmann Institute of Science in Rehovot, Israel. Peter Carr received his B.S. in Chemistry (1965) from the Polytechnic Institute of Brooklyn where he worked with Professor Louis Meites, and a Ph.D. in Analytical Chemistry at Pennsylvania State University (1969) under the guidance of Professor Joseph Jordan. Following appointments at Brookhaven National Laboratory, Stanford University Medical School and the University of Georgia (Athens), in 1977, Dr. Carr joined the faculty at the University of Minnesota where he became Professor of Chemistry in 1981. He has been a consultant to Leeds and Northrup Co., Hewlett-Packard and the 3M Company, and was the founder and first President of ZirChrom Separations Inc. In 1986, he became an Associate Director of the Institute for Advanced Studies in Biological Process Technology at the University of Minnesota. He has been President of the Symposium on Analytical Chemistry in the Environment (1976), founder and first President of the Minnesota Chromatography Forum, and Chairman of the Subdivision of Chromatography and Separation Science of the Analytical Chemistry Division of the American Chemical Society (1988-1989). Prof. Carr has served on the Editorial Advisory Boards of Analytical Chemistry, Talanta, The Microchemical Journal, LC/GC, Journal of Chromatography, Chromatographia and SeparationScience and Technology.